Life insurance is a crucial way to protect your family if you should suddenly pass away. The payout from a life insurance policy can help your loved ones continue to pay a mortgage and other large bills they may not otherwise be able to afford. Life insurance is so important that few people ever decide to terminate their policies. But are there times when canceling a life insurance policy actually makes sense? The surprising answer? Sure. It all depends on who continues to rely on your income and who doesn't. When deciding whether to cancel a life insurance policy, don't focus solely on your age. Yes, the odds are higher that once you get older (past retirement age), you won't have as many people relying on the money you are making today. With fewer people depending on you financially, it might make sense to cancel your life insurance policy and save the money you are spending on premiums. Life insurance is most important when you are worried about providing your children with a financial safety net. When your children are young, they need the financial protection that a life insurance policy provides. After all, they won't be working or generating their own income. But when your children become adults, they might no longer need the payout that your life insurance would provide them if you should die. Canceling a policy designed to protect your kids is usually a sound financial move once these children become adults who are working and providing for themselves. What if your life insurance policy is also a form of protection for your spouse or partner? That might change your decision to cancel, even as you get older. Say you die at the age of 65. Would a payout from a life insurance policy provide that extra bit of financial protection to your spouse or partner? Would it help ensure that this person won't struggle with finances after you die? There are other reasons to cancel your life insurance. Say you are no longer happy with your current plan; maybe the monthly premiums seem too high. 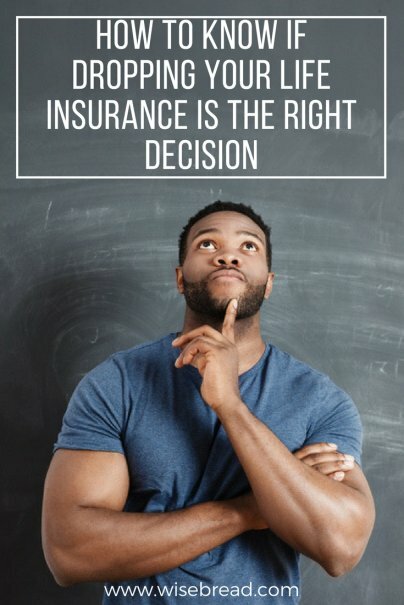 If you shop around and can find a plan that provides enough coverage at a lower price, canceling your existing policy is not only OK, it ranks as a smart financial move. Just be sure to compare your existing policy with your potential new one carefully. Yes, a new policy might be cheaper — but it might also not provide the same amount of coverage. Make sure to do your research before canceling any life insurance policy. Life insurance is supposed to be a financial safety net for your loved ones in case you suddenly die. But what if you've already paid off your mortgage? Your spouse or partner won't need a payout from your life insurance policy to cover that bill. What if you've already paid for sending your children to college? Life insurance isn't necessary to help cover this big expense, either. So why not cancel your policy if those big expenses are already in your past? You can take the money you were spending on life insurance premiums and save it for retirement, add it to your emergency fund savings, or invest in the stock market. Of course, this type of plan only works if you actually will take the money you were spending and do something financially savvy with it. But canceling a life insurance policy when the big bills are paid can be an effective way of putting your dollars to better use.